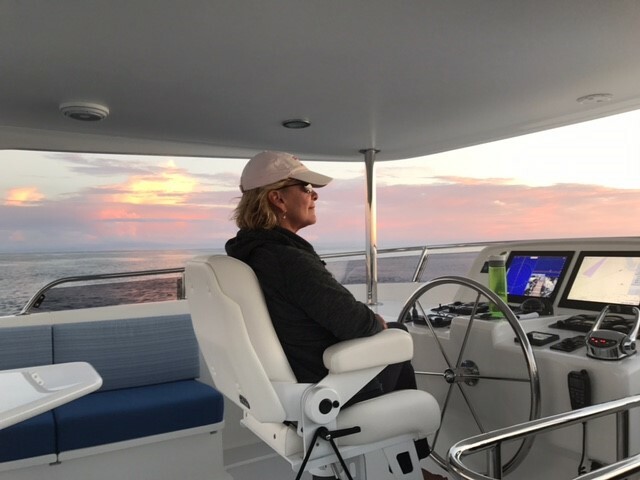 Photographed here is Captain Sandy at the helm of M/Y "SANDANA", on her first 24 hour run from Beaufort, North Carolina to Charleston. Her and her ‘partner in crime’ Dan ran three hour shifts, and are now on their way to showcase this beautiful 610 Motoryacht at the 2017 Fort Lauderdale Boat Show. Sandy’s efforts show prospective owners that Outer Reefs are built for the owner operator’s ease of use, and can be fun to handle with preparation - and tenacity! Thanks for the inspiration Sandy!